This demonstrated theme #1 because the city of Kiev, the Russian capital, is located in the area of a marsh. They obviously put the captial there so that there would be water for agriculture and irrigation systems, because marshes are full of water. 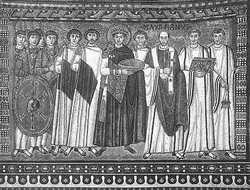 In this picture, the emperor Justinian is seen with military and church officials. This is big for Justinian because he conquered a lot of territory and the Byzantines are connected heavily to the church (MyHistoryLab). The chruch and conquering things is their culture; it was developed in Ancient Rome. This shows the state-building, expansion, and conflict of the Byzantine Empire from 1000-1100. This is huge, because they started to regain much of the territory lost when Justinian was emperor. This shows the creation, expansion, and interaction of economic systems by showing the greatest economic system of the day; the Mongol united Global Exchange Network. Everything and anything was traded east to west and vice versa. This shows the development and transformation of social structures because of the transformation of Russia from polytheistic to monothiestic (more specifically Christianity) religion.